As part of their 100 year celebration Chevrolet set up a weird bracket style voting system in an attempt to pick the best car the company ever produced. 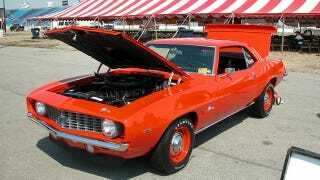 After 124,368 votes were cast the 1969 Camaro came out victorious. Second place went to the 1970 Chevrolet Chevelle SS. I like '69 Camaros and '70 Chevelles just as much as the next guy, in many cases more than the next guy, but are these two cars really the best cars Chevrolet ever made? They're popular and they are certainly cool, but I'm not sold on these choices. The 1963 Corvette Stingray that was voted fourth would probably be my number one. The new ZR1 is excellent and anything from 1955 (especially the Nomad) that featured the first Chevy small block V8 ever made was pretty great, just to name a few. It's not a quite a question of the weekend, but I'm curious what you guys think. Did the voters get it right picking the '69 Camaro as the best car the company ever produced? If not what car do you think should have won?